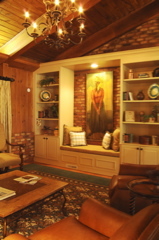 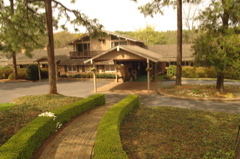 From the Pine Needles web site: "Nestled among the longleaf pines, Pine Needles’ 12 rustic lodges provide exceptional comfort plus all of today’s modern conveniences. On a visit here, you’re going to remember the friendly staff, the pine paneling, crackling fireplaces and golf memorabilia that put you in the mood for your next 18. 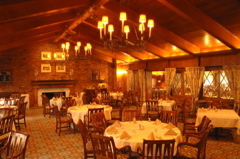 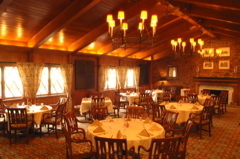 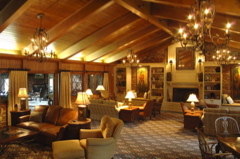 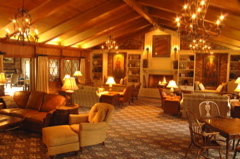 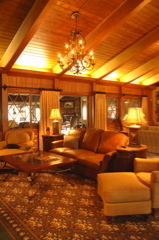 The chalet-style pinewood lodges are connected by covered walkways to the clubhouse, which contains the full-service dining room, the In the Rough Lounge, and the golf shop. 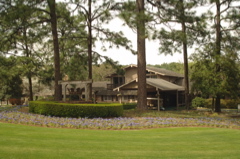 After your clubs are put away and the sun has set on another beautiful day of golf, the cozy lodges of Pine Needles invite you to relax. 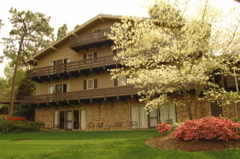 Step onto your balcony or terrace, and let the warm Carolina night embrace you or stay inside for a good movie. 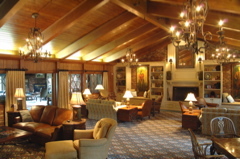 Here is what is available to you in your room or elsewhere in the resort: Cable television; in-room data ports; wireless high speed internet access in public areas; coffee makers; in-room safes; hairdryers; irons and ironing boards; complimentary newspapers; outdoor swimming pool; tennis courts; fitness center (available at Pine Needles to all guests); game room with pool table, foosball and ping-pong."